This is a survey to put up on your own site; answer the questions, slap a link up that leads back to this site so other people can come and take it! I would hope one would have read the TOS, but I'd like to remind here to please not take this survey and simply change the names to use elsewhere, a lot of much-appreciated help was put into this. 4. What appeals to you about Dearka/Yzak? 5. Do you think of them as an official couple? 6. Between Dearka and Yzak, who do you like better? Why? 8. What were your impressions of Yzak and Dearka at the beginning of the series? 9. Did these change as SEED progressed? How? 10. What did you think of them by the end of SEED? 11. What was your overall impression of them in Destiny? 12. At what point in the series did you start to like Yzak? 13. At what point in the series did you start to like Dearka? 14. At what point in the series did you start to like Dearka/Yzak? 15. What's your favorite SEED scene with them? Why? 16. What's your favorite Destiny scene with them? Why? 17. What's your favorite Yzak quote? 18. What's your favorite Dearka quote? 19. What's your favorite official image of them? 20. Which of the mobile suits piloted by them do you prefer? 23. Do you like any doujinshi circles that feature them? 26. 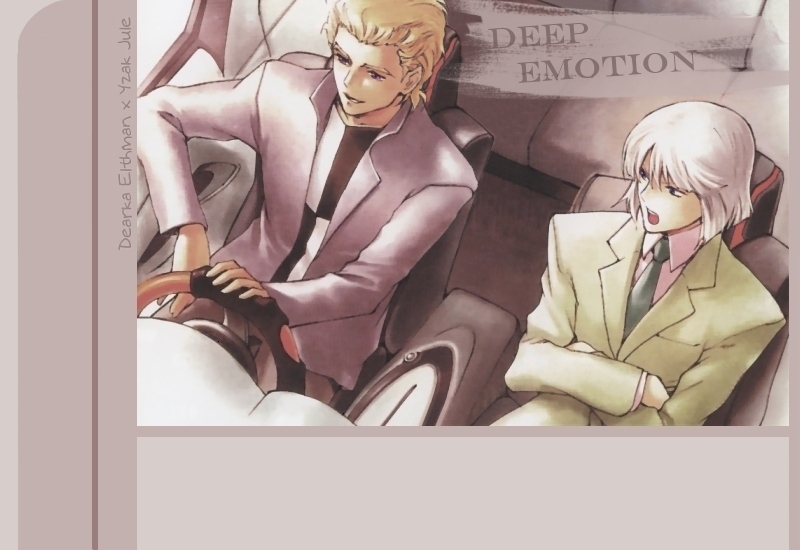 Why do you think Dearka is usually portrayed as the seme and Yzak as uke in fanworks? 27. Do you like this common portrayal? Why? 28. Overall, do you think Dearka/Yzak is accepted in the fandom? 29. Is there anything you'd like to see more of, general fandom-wise? 30. Which seiyuu do you like better/thinks sounds better, Akira Sasanuma (Dearka) or Seki Tomokazu (Yzak)? 31. What did you think of Brad Swaile's portrayal of Dearka in the dub? 32. What did you think of Michael Adamthwaite's portrayal of Yzak in the dub? 33. If you were given a chance to insert an extra scene at any point of the series, what would it be and when? 34. What do you think of the art and animation in SEED and Destiny (in relation to the duo)? 35. Do you prefer the duo's "looks" in SEED or Destiny? Why? 36. What do you think they were like when they were younger? 37. What kind of lives/settings do you think they were in as children? 38. Why do you think Yzak removed his scar after the war? 39. Do you think Yzak makes a good commander? 40. What do you think some of their hobbies would be, other than the ones mentioned by official sources? 41. Suppose they never joined ZAFT, what would they have done with themselves? 42. Do you think the initial Gundams they received (Duel, Buster) suit them? How/why? Explain your answers for Questions 43-48. 43. What animal does Yzak remind you of? 44. What animal does Dearka remind you of? 45. What colors do you associate Yzak with? 46. What colors do you associate Dearka with? 48. Give Dearka an image song of your choice. 49. Describe their relationship with a word. 50. Do you think their relationship would be more dominant/submissive, or reciprocal? Elaborate. 51. Who would you imagine as the stronger half of the relationship? Why? 52. According to the novels, they first met each other when they joined ZAFT Academy. What do you think this first encounter was like? 53. Why do you think they continued associating with each other after that? 54. Who do you think would confess their feelings first? 55. Do you think there is a difference in their behaviour around other people and around each other? 57. Which song (vocal) from SEED/Destiny matches them? 58. Why do you think Dearka is in Yzak's squad, aside from their friendship alone? 59. Why do you think Dearka was able to go back into ZAFT despite his defection? 60. Which one would be the better romancer? 61. Overall, what would their life together be like? 62. They have a date on a day off. What would they do during this? 63. There's an argument between them. What do you think the reason for it is? 64. Who do you think would have started the argument? 65. They exchange presents. What do you think they would give each other? 66. If they ever got a pet, what kind would it be? 68. Where would this home be located? (downtown, suburbs, nowhere, etc) Any reason why? 69. Do you think the two of them would ever make a promise? If so, what kind of promise would it be? 70. Do you think that promise would last? 71. What role, if any, do you think Athrun plays in regard to their relationship? 72. Do you think their parents would accept their (romantic) relationship? 73. What is Dearka/Yzak to you? 74. What do you hope for the pairing in the future? 75. Any words for the people who read this?